I have come to realize that I may be overly fixated on the weather. It’s not the worst thing to talk about, but I could do with some new subject matter. The trouble is, I have not been keeping up well with the news lately; I know nothing about sports; and my taste in music is both un-current and probably a little pedestrian to anyone who might actually like to talk about music with me. Of politics in my city I know shamefully little, and I am late to register my daughter for school in the fall, so I avoid that subject at all costs. I do love to shop, but the various vintage treasures that I’ve unearthed at bargain prices may not be of interest to everyone I meet – and besides, I have declared a pre-move moratorium on acquisitions (and how that is going for me is the stuff of a whole other epic conversation). So you can see why, at a loss for small talk, I drift back to my old reliable, the weather. Aside from the polite innocuousness of weather-related chat, discussing the forecast also offers the opportunity to segue into my absolute favourite topic, which is, as you have no doubt realized by now, what I am going to eat next. And today, because it is a beautiful May day, that happens to be the salad you see here. I actually made this over the weekend, but it makes quite a bit and it tastes better every day. 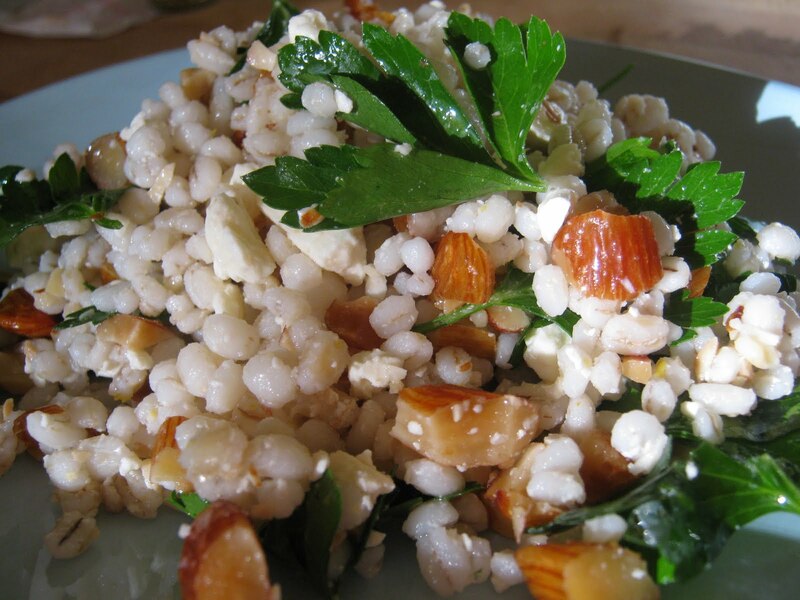 Cook barley in a large pot of boiling, salted water until tender, about 20-25 minutes. Drain and rinse under cold water to cool. Shake out excess water. Meanwhile, whisk together lemon juice, olive oil, garlic and lemon zest in a large bowl. Add barley, parsley, and feta and toss gently. Stir in chopped nuts, toss again, add some salt and pepper if desired, and serve.